It’s safe to say that any team facing Tim Lincecum and the world champion San Francisco Giants this season needs to take care when playing against such a strong competitor. But, for whatever reason, when the Washington Nationals face Lincecum … well, that’s a horse of a different color. 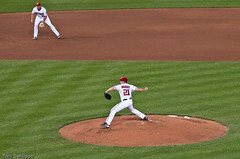 Lincecum made his fifth career start against the Nationals Friday night. The last time he faced Jim Riggleman’s lineup in 2010, he took a loss after allowing six runs in just 4.2 innings at AT&T Park.